The WRMD team is currently working to publish more information on how best to use WRMD. It is one thing to transition to using a whole new system. It is quite another to get to the point of using it appropriately. In the past I have seen some very creative uses of WRMD that made sense, however they did not work with the use of a database. When WRMD is used appropriately it can be a powerful tool, when used a little to creatively it will muddle up your data and analytics. Here are a few reminders of appropriate use that I find are most commonly done a little, too creatively. This one correction alone, can make the biggest difference to your data. I have Blogged a few times about the importance of species identification, The Issue with Common Names, February WRMD Update. In the background, WRMD has nearly every species that could possibly be brought into wildlife rehabilitation, globally. We have imported the IUCN Red List to WRMD, which list almost every species and its status, whether it is Least Threatened to Extinct (we didn’t import extinct animals). In a few cases, we have found species not on our list, and we added them as soon as we found out about them. Along with this import we also added the most commonly recognized Common Names for that species. That is why sometimes you can have both Common Pigeon and Rock Dove. In the background they are the same species and the first Common Name used, will be the name used in any reports or analytics. Please identify your patients and use the Common Name from the drop down menu or your data will be inaccurate. Sometimes you have to type it in completely in order to see it on the drop down. If you can’t find it, message us so we can look into it. On several occasions I have seen Duckling, Fawn or even Baby Bird as a Common Name. These are not Common Names. It is slang for the age of a species. The database will pretty much ignore this Common Name and your data will be completely off. 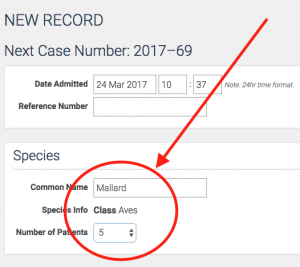 You need to record the Common Name as Mallard, Mule Deer or House Finch and then in the Initial Exam tab you can record the age. Do not use an age term as a Common Name. Something else I have seen that really kinda hurts, is when a Common Name is recorded as ducklings x5. This defeats the whole purpose of using a database. Not only can the Common Name not be identified but you are losing your overall numbers. Right below the Common Name field there is a field for Number of Patients, it is really easy to create 5 records. What happens if 2 of those ducklings die and 3 are released. How do you record that? How does that get translated on your State Report or the Federal Report? There are locations for all that information within WRMD, there is not need to jumble it up and make your data of no use to you. Each patient needs it’s own record. A few times I have seen in Common Name (Education Barn Owl) or (Billy Bob the Barn Owl). Well, this is much like everything I have mentioned above. 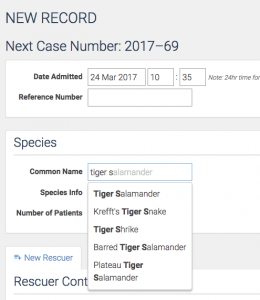 There is a location for the Name of an animal in the Cage Card, specifically for education animals and the large secret group or rehabbers that name their patients… For Resident patients they should maintain a pending Disposition and in the Location box you should record them as Resident within Holding at. Education Animals can be recorded as Resident in the Location box and their Names can be recorded in the Cage Card box, in the Name field. We have been told that one of the best things about WRMD is it’s ease of use. The compromise of allowing WRMD to be easy to use, we lose the ability to control how it is used. We think it is more important to have a system people can easily use then to be very strict and rigid on how it is used. Only through training and outreach can we eventually help people use it more efficiently, for their own benefit. We know many of you have been waiting very patiently the last year for batch updating to be complete. Believe me when I say we got it done as fast as we could. There were many other factors at play that had to be completed before we could get batch updating developed and tested. Batch updating will give you the ability to batch “change” multiple fields at once. At this point not all fields are available, but most of the important ones like Locations and Dispositions are. To batch update your records there are four steps to follow. Each of these steps is important so please pay attention to what you are doing. Batch updating is a powerful tool and if used incorrectly it can really mess your records up, so use wisely my friends. If there are fields that you want to batch update that are currently unavailable, please tell us. We will make fields available as requested once we can ensure that everything is working smoothly. You can not batch update blank values. In other words, you can not batch delete values. Can you image how tragic that could be if used maliciously? Treatment Logs, Rechecks and Locations can be batch updated however they will not edit past entries. They will instead batch create a new Treatment Logs, Rechecks or Locations for each patient. Do a search for terms or fields that all patients might have in common. Example: Search for Common Name=House Finches, Disposition=Pending and current location Enclosure=Aviary 5. This will give you a list of all pending House finches in Aviary 5. Then you might record that they were all released. A hybrid of the 2 above techniques would work as well. 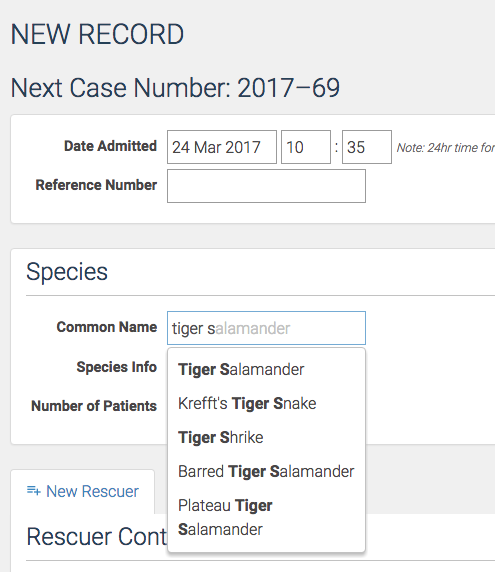 Do a search and then check the checkboxes of the patients from the search results to refine who you actually want to batch update. Example: Search for all Common Name=Grey Fox, then click on the checkbox for the ones that are being sent to homecare. Fill in the information you wish to Batch Update. There are a few tabs available so switch between them as needed. When you switch tabs the information you have already filled in will stay there. The first option is to replace the old data that was in the field with your newly entered data. The previous data will be DELETED and REPLACED with the new data you have entered. The second option is to KEEP the old data and ADD the new data to whatever was there. Lets say you add a keyword to a group of house finches that are Trichomonas negative. That will allow whatever may already be written in Keywords to stay there and the new term will just be added on and separated by a comma. How Should Text Values be Updated? Click Batch Update My Records. You should see the batch update results immediately if you go to the patients. If for any reason you feel that the wrong data was updated or there was any error please tell us. We have spent months working out all sorts of bugs and gotchas with this. This is an amazing tool but it can also be very dangerous. It gives you the ability to destroy multiple records at once so please batch wisely. During the above window, there will be an upgrade of our networking software. 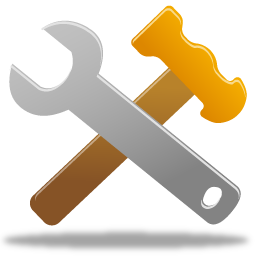 During the maintenance window WRMD will lose networking connectivity for a period of up to five minutes. We expect the actual disruption to be minimal for most, but we will be closely monitoring for issues throughout the window. Do not hesitate to contact support ([email protected]) if you have any additional questions or concerns.